Callitriche heterophylla .Donald Cameron.New England Wild Flower Society.gobotany.newenglandwild.org. (Accessed 5/2014). Callitriche heterophylla is an annual herb, small aquatic or rooted in mud, to 20 cm long, rooting from lower nodes, often in dense patches, stems thread-like, compressed. 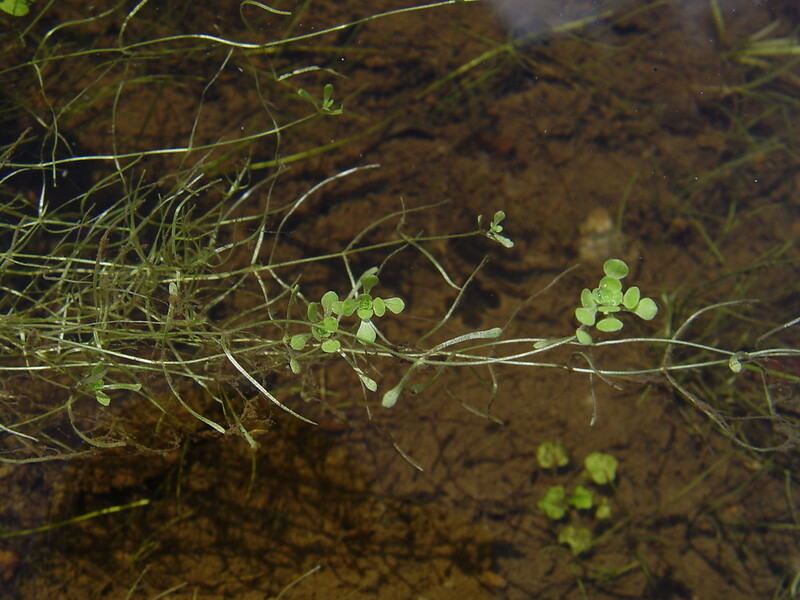 Leaves opposite, those below water linear, to 1.5 cm long, leaves above water spatulate, crowded into a small rosette at stem tips, margins entire. Fruit to 0.1 or slightly less, flattened, margins rounded, very shallowly or not at all grooved; April-Dec.
Notes: Plants eaten by muskrats. Very similar to C. palustris but usually darker green, fruit never winged.